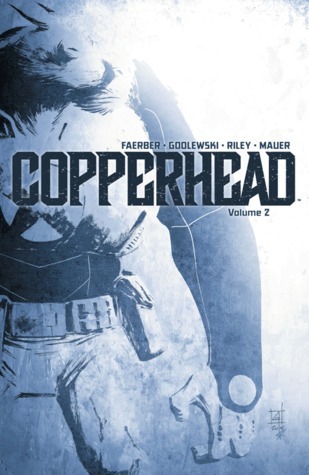 Volume 2 of the graphic novel Copperhead, picks up immediately following the events in Volume 1 but manages to pick up on a new story-line along the way. Sheriff Clara Bronson is starting to settle in to her role in Copperhead and after a climactic apprehension, decides to actually take a night off and wind down. But at the bar she’s witness to a man beating up a woman and hauls him in. Little does she know that his braggadocio boasting of having friends who won’t like his being locked up is true. While Clara goes to finish her date, in a more intimate manner, leaving her assistant Boo (Budroxifinicus) as the lone on-duty officer. The deadbeat’s friends do go to break him out of his cell and look for a little payback on Sheriff Bronson. Bronson is a little tougher than they expected (and has a guardian angel), and the gang of deviants grab Officer Boo as a hostage and take him to a distant town where lawlessness rules and just wearing a law uniform is likely to get him killed. Bronson, with the help of a few other locals rush to get him out. I do like this series. I found myself completely caught up in this story, and the graphic novel was over so quickly (I’ve read shorter books that seem to drag on and on). The characters are interesting to me and unique and there’s enough mystery surrounding the characters and their situations that this alone has me wanting to keep going. The art is really tremendous. As I noted in my review of the first volume, the art is sharp and clear and bright. You won’t guess who is who. You won’t be surprised by odd body shapes and angles. You won’t squint, trying to make out the figures in the darkness. And on top of all that, it’s just plain good. I did enjoy this story, but nearly as much as the first volume. This felt a little bit like a side story while we wait to learn a little more about why Clara is in Copperhead; what she left behind; how her son will survive in this world. What we got instead is a little peek at Boo, his vulnerability and the ‘situation’ of his race. We also see Bronson’s dedication and tenacity. It’s a nice book and possibly one of the best graphic novels being published today. I am a fan and i will keep reading this. Looking for a good book? Copperhead, Volume 2 is a smooth, interesting sci-fi western graphic novel that is worth reading.